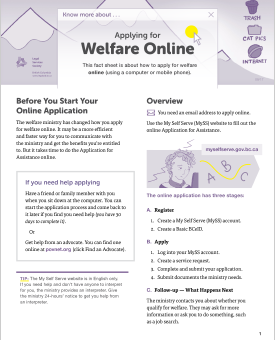 The fact sheet expands on the information printed in the booklet How to Apply for Welfare, which also describes how you can apply by phone or at ministry offices. The fact sheet and booklet are both part of the series Your Welfare Rights. Applying for Welfare Online is available in print and online. how to appeal a ministry decision. It also includes a list of who can help if you have a problem getting welfare, and a checklist to help you keep records. How to Apply for Welfare is illustrated with original drawings, and is the first publication in the new series Your Welfare Rights. 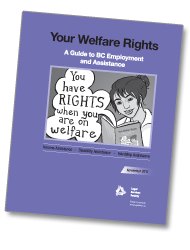 It replaces the booklet Your Welfare Rights: A Guide to BC Employment and Assistance. We’re running out of copies of Your Welfare Rights: A Guide to BC Employment and Assistance. Since we won’t be reprinting this booklet before we run out, please make sure you keep a few copies on hand for staff use in your office. If you have any upcoming training or events where this booklet would be particularly useful, you may want to order your copies now—but please think carefully about how many you order so that we can all make the best use of the remaining supply. The online PDF will remain available. Coming in early 2015, we’ll be releasing the eBook of Your Welfare Rights for those who use mobile devices to access information. How is Your Welfare Rights used now? Your Welfare Rights has been around in one form or another since 1977 and has always been popular. Over the years, it has grown in size and content, including more and more detailed information. In 1997, it was only 58 pages; now it is 168 pages. Your Welfare Rights is intended for advocates and intermediaries, but what we intend and how it’s used are two different things. In 2012, we saw nearly 10,000 print copies distributed in BC. This made us wonder, where are they all going? So we asked. When we surveyed advocates and community workers a few years ago, they told us that almost all (80%) give the booklet to their clients. Some went over it with clients first and some didn’t. We also found out that most advocates don’t use the booklet themselves on a regular basis. Instead, most seem to prefer going straight to the legislation itself. We’ve heard anecdotally, though, that it’s a good resource for training new advocates. Your Welfare Rights is a difficult book to maintain; it’s full of complicated information and the laws and programs it talks about are constantly being updated, meaning that it requires frequent revisions. Right now, Your Welfare Rights comes as a package that contains the booklet itself and an insert, as well as a sticker, that detail legal changes since it was last published. In recent years, we have worked hard to improve the usability of our publications and websites, and on testing our publications with the people who need our information. 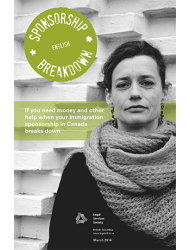 Last year, we interviewed people who were on welfare and wanted to learn more about their rights – the exact type of people, it turns out, who use the booklet most often. Everyone thought the information in the booklet was too overwhelming and some even said they felt increasingly powerless after trying to use it. We followed up with them a few weeks later and no one had taken any action based on having the booklet. This will be disappointing news for advocates who provide copies to their clients, hoping that it will help them take that next step, just as it was for us. No one wants to produce or distribute a booklet that is, in the end, hard to use. Our top priority is to create legal resources that work for our clients and that advocates can use with their clients to help them understand the process and the law. Your Welfare Rights serves some advoates’ needs as a training and reference tool, but it’s become clear that we can better present the information in Your Welfare Rights better for the general public. Over the next year, we’ll be developing a new publication that will meet the public’s needs. The current booklet is going to remain online as a PDF, and soon as an eBook, for advocates and for training purposes. Stay tuned to the Factum for details and updates. Please send any feedback you have on this, or any other LSS publications, to publications@lss.bc.ca.